Once again, all the subjects covered by the website over the past twelve months have been a delight to compile and research. But here are five subjects which proved particularly interesting when peeling the layers away. Click on the titles or associated pictures to read the items! While Invisible Bordeaux isn’t quite a no-wine zone, the website aims to uncover slightly more unusual examples of local produce. One of my favourites has been the story of Jock, who manufacture a legendary dessert crème that many people from the area regard as one of the most evocative foodstuffs of their childhood. Visiting the Jock factory shop, and later the factory itself, it was interesting to see how much the company has diversified into other products, some of which I put to the test when preparing the article (I’m a big fan of doing research when you can eat the evidence). The good people of Jock were very appreciative of the resulting piece, making it happy days all round! When I picked up a number of old postcards showing the Allées de Tourny with a majestic statue of statesman Léon Gambetta, I naturally wondered what had become of the monument, which was the centrepiece of the promenade from 1905 until the 1960s. With help from correspondents at the Musée des Beaux-Arts and Musée d’Aquitaine, I was able to track down a plaster cast scale model of the statue and establish that the original is now kept behind closed doors in the reserves for outsize objects of the Musée d’Aquitaine. Will it ever be on public display again? Very little has been written about Saint-Jean-des-Palus chapel, which today lies in ruins just off a road which connects Blanquefort with the Médoc wine-growing territory. It therefore felt useful to be documenting the history of the church and there was a bit of a Eureka moment when I compared one of the photos I’d taken with an old postcard and realised I’d captured more or less the same angle. Getting the shot (and entering the edifice) involved crawling under some barbed wire, which felt very naughty and dangerous, but sometimes it feels as if rules do have to be bent in order to feed this website! 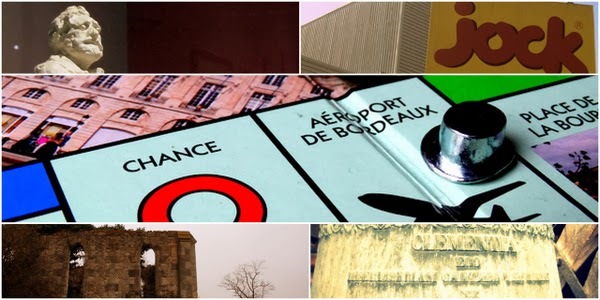 Invisible Bordeaux is always on the lookout for new itineraries through the city and using the Bordeaux edition of Monopoly as a roadmap seemed like an idea that had legs! Or rather wheels, as I attempted to “collect” all the addresses on the board during a single morning spent cycling from the Lac district to Mérignac airport via a good number of stops in-between! The venture resulted in a three-part travelogue featuring lots of photos and the descriptions of random, unexpected scenes (such as wedding photo sessions on Esplanade des Quinconces and the sound of someone practicing cello on Rue d’Aviau). Above all, it was also a chance to use different-coloured fonts to link each address up with its relevant set on the Monopoly board! So that was 2013! Here's to another year of hunting high and low for more invisible subjects in and around Bordeaux... Thank you for reading this far and please call again!